August Weismann (1834-1914). 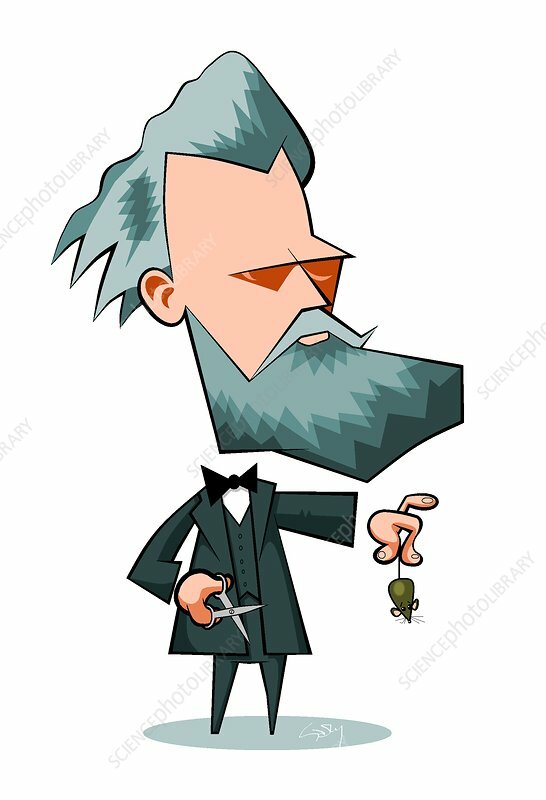 Caricature of the German evolutionary biologist August Friedrich Leopold Weismann holding a mouse and a pair of scissors. Weismann is best known as one of the most notable evolutionary theorists of the 19th Century. He worked in heredity, proposing that all organisms contain a 'germ plasm'. He later identified this with the chromosomes of the cell nucleus. He proposed the chromosome number halved by division in reproduction, with one half from each parent merging. He saw this as the basis of variability. He helped prove this theory by cutting off the tails of 68 white mice repeatedly over 5 generations and showing that no mice were subsequently born without a tail or even with a shorter tail. This put a final end to Lamarck's theory of the inheritance of acquired characteristics.